Join us for the 52nd Annual Feast of the Hunters Moon on October 5-6, 2019 at Historic Fort Ouiatenon Park near West Lafayette, Indiana. Thousands of skilled interpreters, French, English and other military reenactors, musicians, and artisans engage the imagination while inspiring exploration of the music, cultures, and crafts of the past. The first European settlement in Indiana, Fort Ouiatenon experienced different cultures and lifeways that built our nation. The Feast of the Hunters Moon offers both the public and the participants a realistic portrayal of the people, cultures, and lifestyles that existed on the French and English colonial frontier in the Great Lakes region during the time of Fort Ouiatenon, which encompassed the period from 1717-1791. We want to interpret this time and place as accurately as possible in order to offer the public an educational and unforgettable experience, and also to honor the people who lived here. The Feast of the Hunters Moon is a weekend festival and historical reenactment held each fall on the first weekend of October (first Sunday) since 1968, at the present-day site of Fort Ouiatenon, a replica 18th century French military and trading post near West Lafayette, Indiana. The Feast is held on the grounds of the Historic Fort Ouiatenon Park, on the Wabash River. The blockhouse is a replica of the original Fort Ouiatenon, which was the first fortified European settlement in what is now called Indiana. The fort served as a French trading post and was located approximately one mile downriver from the replica. During the festival, participants reenact the annual fall gathering of the French and Native Americans which took place at Fort Ouiatenon in the mid-18th century. Participants dress in the garb of the 18th century French soldiers, settlers, and Native Americans who lived in this region. Food vendors sell traditional period foods such as rabbit stew, voyageur stew, and venison sausage. The program also includes music, marching, dancing and renenacted military maneuvers. As part of the event, various musical acts perform, including Native American drummers, historical folk music performers, French folksingers and period fife and drum corps. The Feast of the Hunters Moon is held on the grounds of Historic Fort Ouiatenon Park, a primitive country setting on South River Road, four miles southwest of West Lafayette Indiana. The grounds stretch across more than 30 acres along the banks of the Wabash River. Handicapped Accessible: Authorized vehicles may use handicapped parking area located near the west entry gate. Handicapped accessible toilets are available. A handicapped accessible shuttle bus is available from the Purdue University parking lot. Please note that the terrain of the Feast grounds is uneven. Parking: If you are coming from outside Lafayette, we recommend you use the free parking available at the Purdue University Lot L – M, north of Ross-Ade Stadium at the corner of Northwestern and Cherry Lane. You can follow the signs for the Purdue Ross-Ade Stadium. Shuttle Buses run continuously from the Stadium to the Feast from 8 am to 6 pm (Saturday) / 5 pm (Sunday) Eastern Daylight Time (EDT). Thursday: “Special Kids Day” reserved for special education students at all grades. Students with special needs come for the day to participate in 18th century life on the Ouabache. The Thursday before the weekend of the Feast. Friday is “Feast Friday Fun Day” reserved for first through sixth grade students. Students visit a variety of re-enactors, craftspeople, and entertainers making history come alive! The Friday before the weekend of the Feast. Call (765) 476-8411 extension 206 for more information or reservations. The number and type of food booths is amazing. If you’re hankering for fry bread, buffalo stew, Rabbit Stew, Roasted Corn, Buffalo Burgers, Homemad Roootbeer, or breakfast, lunch and dinner fare, this is the place. Most food booths are operated by local not-for-profit groups that use their proceeds for charitable projects. 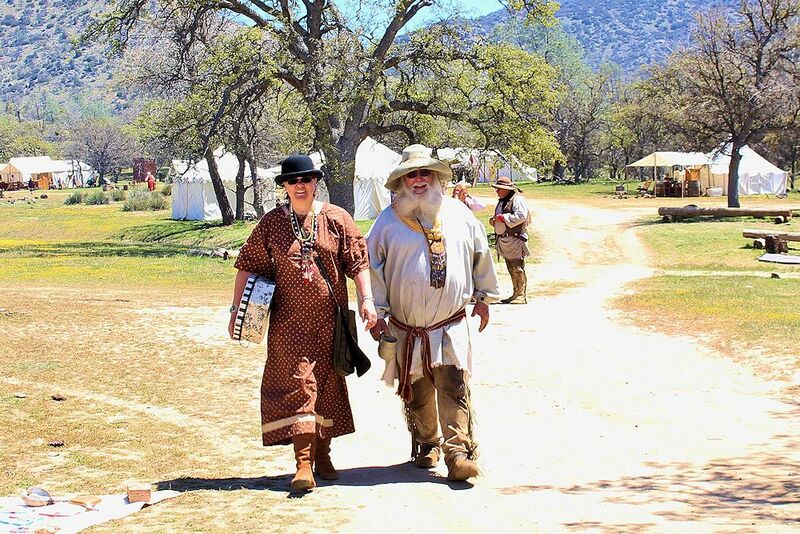 As you would expect, a huge gathering of sutlers will be present at the Feast of the Hunters Moon to offer period-era wares and crafts. Furs, clothing, wood work, toys, baskets, applehead dolls, musical instruments, barrels, cast iron fireworks, quilts and blankets, pottery, herbs, leather, and much more will be available for you to peruse and purchase. At the Feast of the Hunters Moon We want to interpret this time and place (French and English colonial frontier in the Great Lakes from 1717-1791) as accurately as possible in order to offer the public an educational and unforgettable experience. Participants, merchandise, entertainment, and food should be appropriate to our time period and place, to the best of our knowledge and ability. Please read carefully the quality control section on the “Feast Participation Webpage“. All participants are responsible for knowing what types of costume, equipment, and merchandise are appropriate for their area. The Feast is full of sights and sounds that will be a treat for all ages. In addition to the many performances, displays, and the scenes of live from the 18th century, these booths have crafts, merchandise, and activities that have proven to be especially interesting to younger Feast visitors. Holy cow, there’s so much to see and do! Be sure to mark your calendar today for the annual Feast of the Hunters Moon at Historic Fort Ouiatenon Park near West Lafayette, Indiana!